(Nanowerk Spotlight) The study of very thin structural foams for cushioning and energy dissipation is, now more than ever, of primary importance in the engineering world, for example for the protection of electronic gadgets (such as MP3 players, cell phones, PDAs, etc.) from microimpacts due to accidental drops, as well as in the security area, for mitigation of explosive loading in macro scales. The advancement in the controlled growth of carbon nanotubes and other nanostructures has allowed researchers to create improved systems designed accurately for specific engineering applications. Carbon nanotubes in particular have been well known to the scientific community for over 15 years now (they have been defined as the most popular teenagers in science). Thanks to their fascinating properties they are beginning to be used or considered for a variety of electronics and biomedical applications such as sensors, actuator devices, displays, batteries, drug delivery and other miniaturized devices. (a)-(b) Low and high magnification SEM pictures showing as-grown forest of coilshaped carbon nanotubes (CCNTs) used for the experiments. (c)-(d) Low and high magnification TEM images of a bundle of the CCNTs. (e) Schematic diagram showing the stages of interaction and full recovery of the CCNTs array during and after the impact deformation. 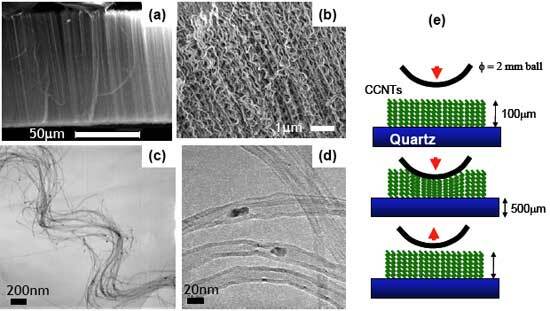 The creation of well controlled carpets of vertically aligned and uniformly coiled carbon nanotubes by Dr. Wei Wang (then a graduate student at Clemson University) supervised by Prof. Apparao Rao might now extend new horizons for applications in the nanoworld. They were able to grow very uniform foam-like forests of coiled carbon nanotubes in a thermal CVD reactor with controlled thickness and uniform coils diameter (~20 nm) and coiling pitch (∼500 nm). This relatively defect free structures showed the potential for developing active nanospring devices, as well as protective coatings, when used in their as grown dense foam-like form. Dynamic studies of these aligned forests of nanocoils have been recently developed at the Materials Science and Engineering Program at UCSD at the University of California, San Diego in the groups of Prof. Vitali Nesterenko and Sungho Jin, by Chiara Daraio, then a graduate student at UCSD. The analysis has resulted in exciting new findings published in a recent paper titled "Impact response by a foamlike forest of coiled carbon nanotubes", published online on the 22 September issue of the Journal of Applied Physics. They report that these mats of coiled nanotubes add a nonlinear spring response to their well known exceptional elastic stiffness and resilience that makes them quite suitable for the creation of tunable protecting layers for devices under impacts. Simple microimpact experiments based on the use of a piezogauge for the detection of the forces allowed the estimation of the dissipated energy in conditions of dynamic loading. These weight-drop tests were preformed to determine the attenuating properties of these foamlike films and showed a dramatic reduction of the pulse amplitude combined with a quasi-perfect elastic response (the extrapolated coefficient of restitution was close to 1), exhibiting a full recovery of the initial deformation after the impact. In addition, the force-displacement response derived from the experiments showed that these nanocoils forests have an intrinsic highly nonlinear behavior very different, for example, from the one observed in the impact between an elastic sphere with a plate (Hertz law) and from that of other carpets of carbon nanotubes with different microstructural properties (derived from different conditions of growth). The groups are now working on trying to model the mechanism of formation of these vertically aligned coiled nanotubes, to provide further insight on the control for their larger scale fabrication and potential technical applications. These remarkable properties observed in the foamlike films of carbon nanocoils could open doors to several other new applications, for example in creating phononic crystals, delay lines and tunable acoustic wave guides. By Dr. Chiara Daraio, currently an Assistant Professor at the California Institute of Technology in Pasadena, CA. She can be reached by telephone (+1-626.395.4479) or email ([email protected]).